At the end of the month, a bomb, hidden in a package inside a private garden, exploded in the hands of a boy, killing him. Allegedly, the murder is related to an event happened in March 2016, when the victim’s brother shot two cousins, injuring one and killing the other. Around the same time, a murder and an attack were committed. A man was killed in his car by a neighbor, apparently for a dispute that had occurred in the bar of a village. In the car there was also the 10-year-old son of the victim, who remained unhurt. In Korça (southern Albania) unknown people shot at a man’s car, fortunately without causing victims; his son thinks it might be a revenge for a robbery he had committed in 2008. 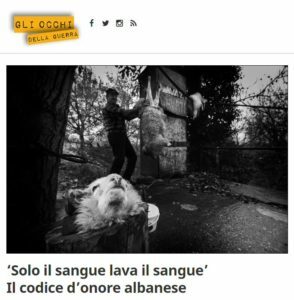 Operazione Colomba carries out a monitoring activity about data related to the blood feuds phenomenon in Albania by reading and analyzing articles published in the press on a daily basis. 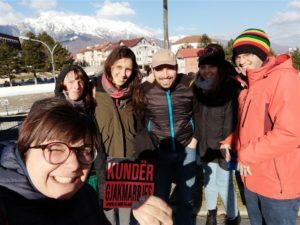 Every day the volunteers read 3 newspapers of the Albanian national press and try to monitor also the foreign press, looking for elements that can attribute crime news stories to the blood feuds phenomenon, when it is not already clarified in the press. The identified cases are then classified in a database, according to a subdivision between cases of hakmarrje (vengeance) and cases of gjakmarrje (blood feud). The data collected in 2018 show a constant trend in the use of violence to approach disputes caused by different reasons, with an average of 11 cases per month of vengeance, throughout the national territory. The 5 cases attributable to the blood feud result as a consequence of vengeance acts previously committed, according to mechanism of retaliation, typical of private justice. The case occurred in Spain highlights the phenomenon of the so-called blood feud export, a phenomenon that involves the victims even when they are abroad. For further information on the classification and on the geographical and numerical distribution of the phenomenon, see the triennial Report “Descriptive document on the phenomenon of ‘hakmarrja’ and ‘gjakmarrja’ to raise awareness among Albanian and international institutions – III edition”, p. 18. When talking about the phenomenon of the blood feuds in Albania, there is the risk to address superficially an issue that, actually, is difficult to grasp. “The blood feuds phenomenon is unfortunately still a tangible and significant reality in some areas of Albania. Not only the European Union but also the Albanian institutions have recognized the existence of the phenomenon”. This is what Operazione Colomba, the Nonviolent Peace Corps of the Comunità Papa Giovanni XXIII Association, stated in a note about the interview of the Counciellor of the Albanian Minister of the Interior to the Italian TV broadcast “Le Iene”. “The phenomenon violates the fundamental human rights, including, first of all, the right to life and also causes as a consequence the problem of self-isolation. To eradicate this problem – the note goes on – it is necessary to guarantee the certainty of penalty as its absence can contribute to the use of vendetta as a form of private justice”. Operazione Colomba, the Nonviolent Peace Corps of the Comunità Papa Giovanni XXIII Association, has been present in Albania since 2010 to fight the blood feuds phenomenon. Operazione Colomba works through the permanent presence of volunteers who daily visit people involved in this social plague, supporting them and implementing mediation and reconciliation processes among the parties in feud. 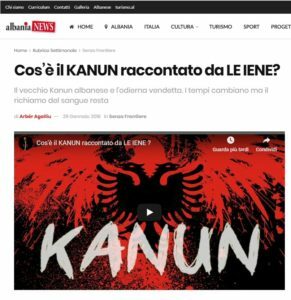 With reference to “Le Iene” broadcast, aired on the Mediaset networks on 10 February 2019, Operazione Colomba reports below some words of Albanian Interior Minister Counsellor Hilë Lushaku: “Currently there is no such phenomenon […] blood feuds are the product of some associations to obtain funds […] It is a phenomenon now gone by, that abroad is being magnified, to create problems to Albania […] Our experts are considering reviewing the article which deals with blood feuds and remove it from the Albanian penal code”.